About half a year ago I set the theme that at our next meeting we had to bring a record by someone who had been discussed at our previous get together. It seemed like a good idea at the time. Often the records that we are not playing – but talking about – sound like they could be even better than the fodder we are consuming there and then. We also like to play ‘Spot the Influence’, aka ‘This sounds a bit like…’ incessantly, although I have to admit that I am probably the biggest culprit in this respect, so names crop up regularly but often only a couple of us actually know what they sound like. I thought it might be fun to try to connect together two consecutive evenings in this way, join the dots and hear what all the fuss was about. It sort of worked too, but perhaps would have been even better if we hadn’t done the politician/teacher thing of having the summer off and could actually remember the conversations we had had! In the event I am not sure why I brought up Spacemen 3 at our previous meeting but I think (and I am very happy to be corrected on this) it might have been at the point where Rob’s Haxan Cloak offering went all poppy and something there reminded me a little of Playing With Fire’s gargantuan, and somewhat idiosyncratic, centerpiece, Suicide. Suicide (the track) is an obvious tribute to Martin Rev and Alan Vega’s band of the same name but filtered through the haze of a very different cocktail of mind expanding substances. Whereas Suicide (the band) played mainly hushed, barely there, pitter patter pop (with the occasional bloodcurdling scream admittedly), Suicide (the song) is a full on aural assault; a pummeling, repetitive onslaught that needs the volume to be set to 11 to register the full impact. Seeing as the rest of the album is really nothing like it, and recalling the effect that The Haxan Cloak had on us, I can only assume that the connection was made in this way. Funnily enough the majority of Playing With Fire is much closer in spirit and sound to Suicide’s eponymous debut album, especially its more blissful songs like Cheree and Girl. And to my mind, this is where it really hits it stride – minimal electronica with hushed vocals and pulsating drones sounding far more radical and enthralling than the somewhat tired, adolescent sloganeering and ‘Stoogeslite’ riffing of the ‘big’ hit single Revolution – which, as Rob pointed out on the night, really hasn’t worn all that well over the intervening 27 years. A staple of indie discos at the time, perhaps that’s where it should have stayed! I bought Playing With Fire at the time of its release and was immediately hooked. I loved the sounds (which were unlike anything I had heard before) and, curiously, I was also really drawn to the coolness of the band. Being staunchly anti-drugs, I had no time at all for friends and acquaintances who dabbled, yet here I was, thrilled to be listening to a band who openly promoted the use of hallucinogens! This inconsistency made little sense to me but was something I felt deeply at the time. Thinking back now, it was almost as if, through listening to Playing With Fire, I could experience the effects of the drugs (which always fascinated me) without having to sell my principles or take the risks. The Spacemen were taking the trip to the other side and reporting back with what they found there. Cool. Of course, that all sounds like total bobbins to me now and, to be perfectly honest, my feelings towards the record have diminished as a result. 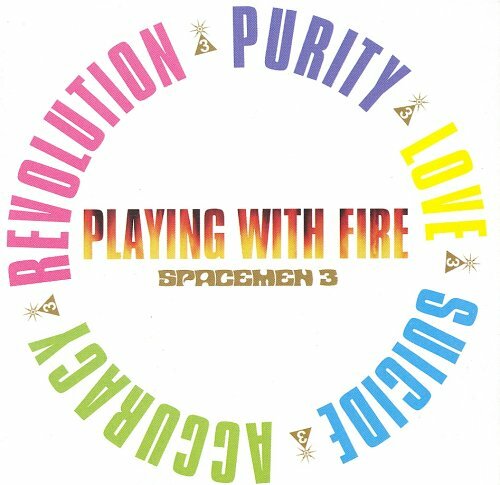 So Spacemen 3 are no longer ‘my favourite band…like…ever’, Playing With Fire is no longer the coolest thing since sliced bread and, it turns out, the ‘other side’ just happened to be a record that had been released a decade earlier and still sounds more dangerous, revolutionary and groundbreaking. Yet, despite these misgivings, I would attest that Spacemen 3’s third album is (on the whole) a damn fine listen that has held up surprisingly well over the intervening years and still manages to sound reasonably cool even in 2015. Rob listened: An absolutely seminal record for me, this. Several years ago to this very day I arrived at university with my Fall and Pixies tapes and my poster of Morrissey’s shaved armpit. I assumed everyone else would be in tune with me and I was wrong. No-one liked the Smiths, The Fall hadn’t crossed their radars and PiL were an irrelevance. Instead, at least two of my new flatmates both had ‘Playing With Fire’ posters blu-tacked to the flaky paint on their bedroom walls. This was the club the new kids were in, and I was clueless. I was even more bewildered when I actually heard the record. No raging punk rock guitars. No cinder-throated vocals. No pounding percussion. Actually, no percussion to speak of at all. Now, several years later, some of these sounds are the most evocative in recorded music. That spectral, bending guitar. That sobbing reverb, eked out with a dancer’s precision. That bronchial farfisa organ. Or was it a vox? ‘Playing With Fire’ is one of the handful of records that completely changed the way I listened to music and rewired what I looked for. The space, the pace, the mood were all things I had never come across before and, after some considerable time to be fair, I was intoxicated by it. Tom’s brother and I used to lie on the floor in the dark listening to ‘Suicide’. It was about the most transportive thing I did during those three years. And now? Well, it still sets my spine tingling, although I’m not sure how well some of it holds up. As Tom has intimated, some of it really doesn’t. ‘Revolution’ really did used to sound like the barricades were being kicked in and now it just sounds impotent. It’s probably fair to class Spacemen 3 as baton carriers, taking the message from Suicide and the Velvets and keeping it alive for another generation to make more of. Nonetheless, there are things that they did that still sound like no-one else has ever sounded. And when those guitars shine out like warm sun-rays over the horizon, man, it transports me. Nick listened: I bought copy of this while at university, more than ten years after it originally came out and a good couple of years after I’d fallen in love with Spiritualized’s Ladies and Gentlemen… and then explored their previous two albums with great eagerness. I’d read about how influential Spacemen 3 were, and heard “Hypnotized”, which, of course, sounds almost exactly like early Spiritualized songs (Pierce has seemingly spent 30 years rewriting the same three songs with vaguely different arrangements). This, however, sounded 50% like cheap demos of early Spiritualized and 50% like someone loading computer games on a ZX Spectrum in 1983 from cassette tapes. Completely underwhelmed by its “psychedelia”, I sold/gave away/lost my copy. So hearing it again was intriguing; the criticisms still stand – it is cheap and rudimentary sounding – but they matter a lot less to me now; there’s something really interesting here now, that, with 15-odd years more experience and understanding racked up in my listening, I can appreciate as having been potentially pretty seismic at the time. From what I’ve read I suspect I’d like Recurring more than this, but thanks to Tom and Rob’s enthusiasm I’m now intrigued to explore further, and find out what I dismissed all those years ago. Great reviews – very similar experiences to me – I think Revolution was 1st thing I heard and at the time they probably edged out Sonic Youth to me my band! Even to point of having a Black Leather Bikers jacket with Tassles down the sleeves and across the back that my girlfriend of time the painted the S3 logo on to, I still yearn to have that jacket back. Again although I love them still dont even the albums as much as a did back in the day – have you heard the “Evening of Contempary Sitar Music” bootleg with just 1 40 min drone track?